The Pentek DGD-7525 water filters have two separate gradient density layers that enhance cartridge performance. The Pentek DGD-7525 larger diameter of the prefilter reduces the particle load to the postfilter, allowing it to operate at higher velocities. The effective DGD-7525 filter depth is increased to a full 233% of standard spun-polypropylene or string-wound filters. This increased depth provides for very high particulate reduction efficiencies and added loading capacity. The Pentek DGD-7525 water filters reduce the need for multiple housing step-down filtration systems. The Pentek DGD-7525 filter cartridge reduces extra fine dirt, sand, sediment, silt, rust particles, and scale particles. The Pentek DGD-7525 water filters are pure polypropylene construction resistant to chemicals and corrosion. The Pentek DGD-7525 replacement filters are designed for purity, bacteria resistance, and chemical resistance. 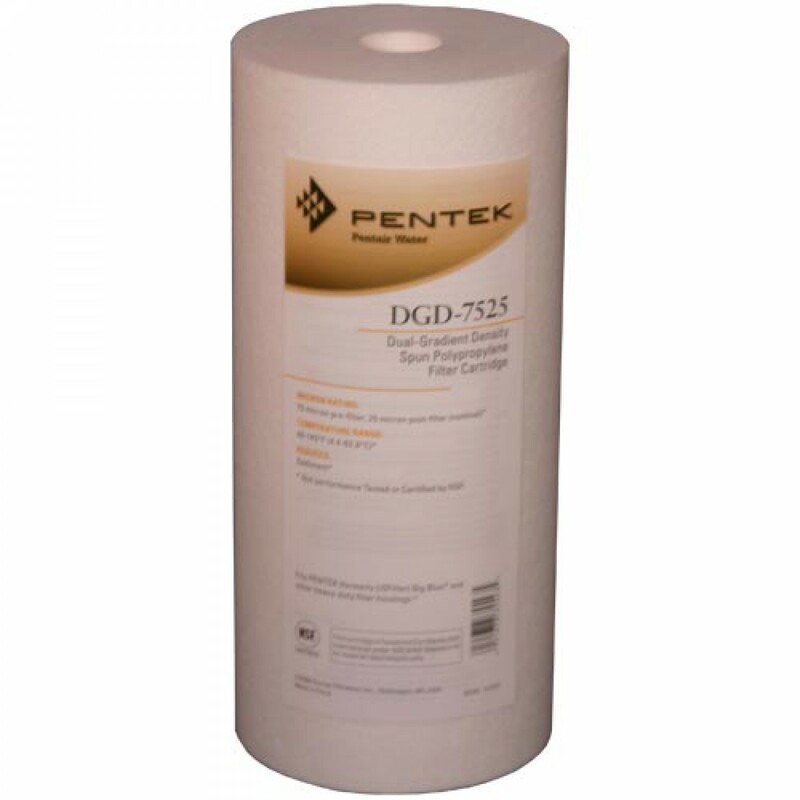 The Pentek DGD-7525 water filter cartridge will not add taste, odor, or color to the liquid being filtered. The Pentek DGD-7525 water filter has three times the dirt-holding capacity of similar sized sediment cartridges. The Pentek DGD-7525 water filter is ideal for all residential, rural, commercial, industrial, and municipal applications. The Pentek DGD-7525 filter cartridge has a 75 micron fine sediment prefilter layer and a 25 micron extra fine sediment postfilter layer. The Pentek DGD-7525 water filter is easy to install in whole house systems or commercial water systems. 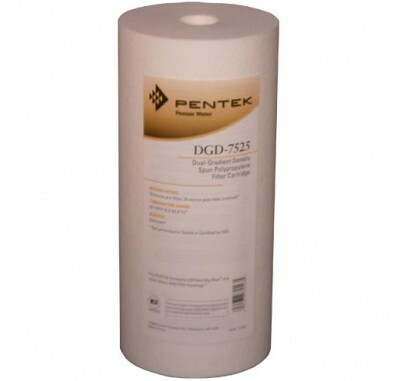 Replace the Pentek DGD-7525 sediment water filter cartridge every 2 months or 8,000 gallons of water. The filter change interval also depends on your water supply and water usage. For use in Ametek, US Filter, Culligan 10" Big Blue housings. The following Culligan model holds the DGD-7525 sediment water filter cartridge: HD-950. The following Ametek, USFilter, and Plymouth Products model holds the DGD-7525 sediment water filter cartridge: #10 Big Blue. The Pentek DGD-7525 Sediment Water Filter Cartridge also fits Cuno AquaPure, Omni, Sears, Fulflo, Teledyne Water Pik, Ace, Master Plumber, Flotec, Honeywell, General Electric, American Plumber, and most other water filter housings for 10" x 4.5" filters.